With MP3 OwnerGuard you can Create, Distribute and Sell your valuable Audios in MP3 format while OwnerGuard protects digital rights for them. Let Security Stronghold support team solve your problem with M-Audio Delta Taskbar Icon and repair M-Audio Delta Taskbar Icon right now! 123 Audio CD Ripper makes direct digital copies from audio CDs and saves them as MP3s, WMAs, OGGs, APEs or WAVs. 123 Audio CD Ripper is very easy to use and have fast speed. Just click on one button a CDs will be extracted. Download CD Tracks' titles from the Internet CDDB. It's fast, easy to use while powerful. 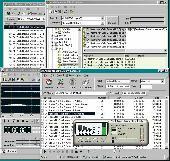 A1 Audio Ripper is a very easy to use software to convert your CD to MP3, WAV, WMA or Ogg Vorbis formats. It provides excellent output quality and high ripping speed. And it can retrieve CDs' information from remote CDDB and create your local CDDB. ALO Power Audio Converter is an audio conversion tool that allows you to convert various audio formats (WAV, MP3, MP2, MP1, MPEG, MP4, AAC, OGG, AVI, MPC, MOV, QT, WMA or 3GP) to WAV, MP3, MP2, OGG, AC3, VOX or AMR format. .
ALO Power Audio Converter is an audio conversion tool that allows you to convert various audio formats (WAV, MP3, MP2, MP1, MPEG, MP4, AAC, OGG, AVI, MPC, MOV, QT, WMA or 3GP) to WAV, MP3, MP2, OGG, AC3, VOX or AMR format. Apollo Audio DVD Creator is an innovative tool to make your own music DVD. With Apollo Audio DVD Creator you can easily import over 1000 songs(MP3,WAV,WMA,OGG,MPG,AVI etc) or grab tracks directly from Audio CDs and burn into DVDÂ¦R/RW disc.With powerful DVD navigation menu,you could browse and enjoy your favorite albums conveniently on car or home DVD player.